My crepes are great with Nutella – but will they hold up in a challenge against my partner’s mom’s recipe? It would seem that everyone’s looking for good gluten free pancakes, or at least a good recipe. Even when I ate gluten, I was never much of a pancake (or waffle, or any sweet breakfast) eater; as an adult, though, I have come to enjoy a good crepe. I developed my own super easy recipe and I’m pretty happy with the results. But then, my partner Legend got his mom’s recipe and we decided to compare. Here are both recipes and how they stack up against each other. Put everything together in a bowl or Pyrex measuring cup (I like the cup because it has a pour spout.) Mix it up really well with a whisk. Set the batter aside, on the counter, and leave it there for 10 minutes. Seriously, do not skip this step. Gluten free flour tends to absorb a lot of liquid, so you’ve got to give it time to do this. 10 minutes later: stir up the batter again. I stirred between each pancake I cooked, just to be safe. Heat some butter in a medium frying pan over medium heat. When the butter starts to bubble, pour a thin layer of the batter into the pan. Swirl it around to cover the whole bottom of the pan. When the bottom starts to get a bit golden, flip it with a spatula. Let the other side cook until golden. Stack finished crepes on a plate. Repeat until you’re out of batter. Extras can be wrapped in plastic wrap and stored in the fridge for a few days. They are best reheated in a pan. Mix everything in a blender. Since there’s butter in the batter, you don’t need any extra for frying. Pour a small amount (about half a *ladle ) into a medium frying pan over medium heat and swirl around the pan to get an even layer. Cook until golden; flip and repeat. Stack finished crepes on a plate. Repeat until you’re out of batter. Leftover crepes can be rolled in plastic wrap and frozen. We had to make these twice; the first time we made them, we did several things wrong. First, when his mom sent the recipe, she had used heaping spoonfuls but I assumed we needed level ones. 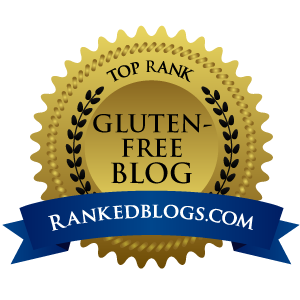 (The recipe above has now been adjusted to use level spoonfuls.) Second, we didn’t use softened butter. This is a big mistake, because you end up with chunks of butter in your batter. Our first few pancakes stuck to the pan and we had to stop and call for backup. Once we realized all the butter was at the bottom, we re-blended and make sure to stir between each pancake. 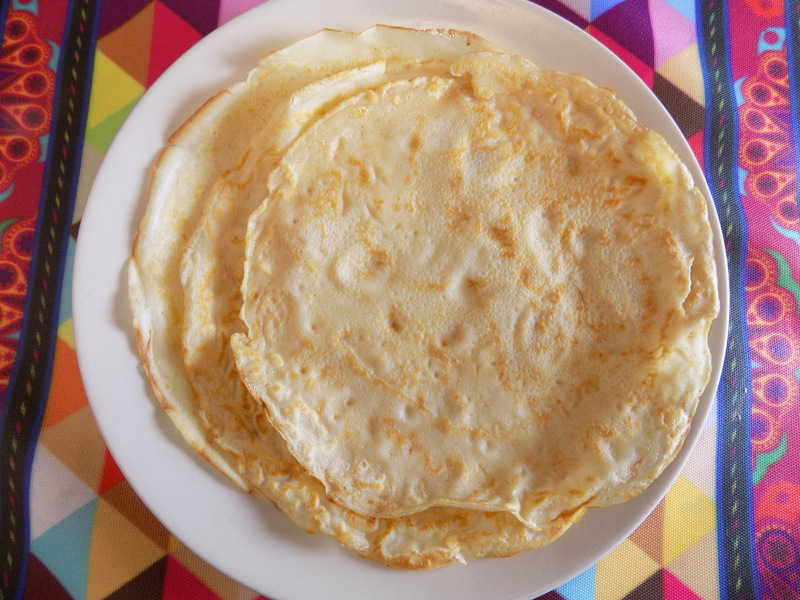 My crepes are really, really simple. They are a great vessel for other flavorful things, like *Nutella, cinnamon apples, or cheese and *green chile with garlic cream sauce. 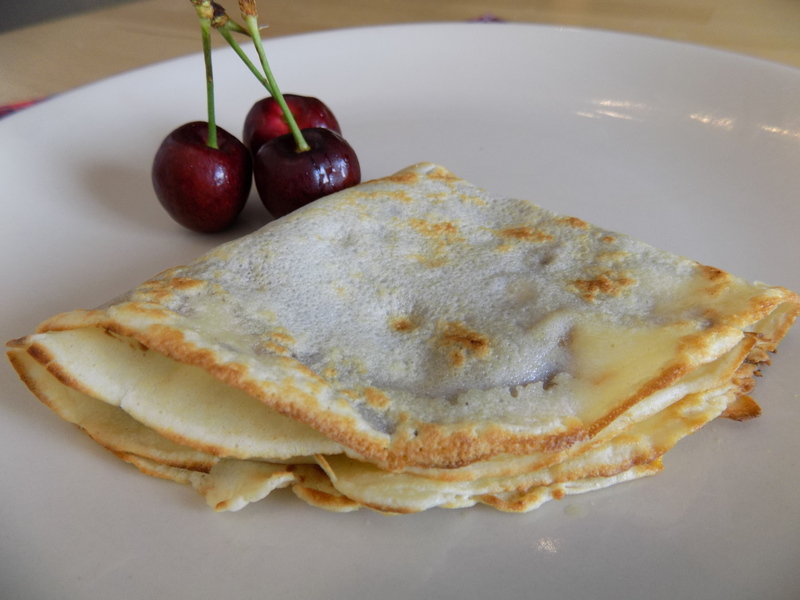 (Things you can do with crepes will be in an upcoming recipe post!) Legend thinks there is a weird flavor to them which he suspects comes from the rice flour. (He eats gluten so he still remembers what wheat products are like.) I do not detect any weird flavor. Legend’s mom’s crepes, filled with cheese and mayo, topped with tomato sauce and more cheese. Yes, I used sliced cheese. 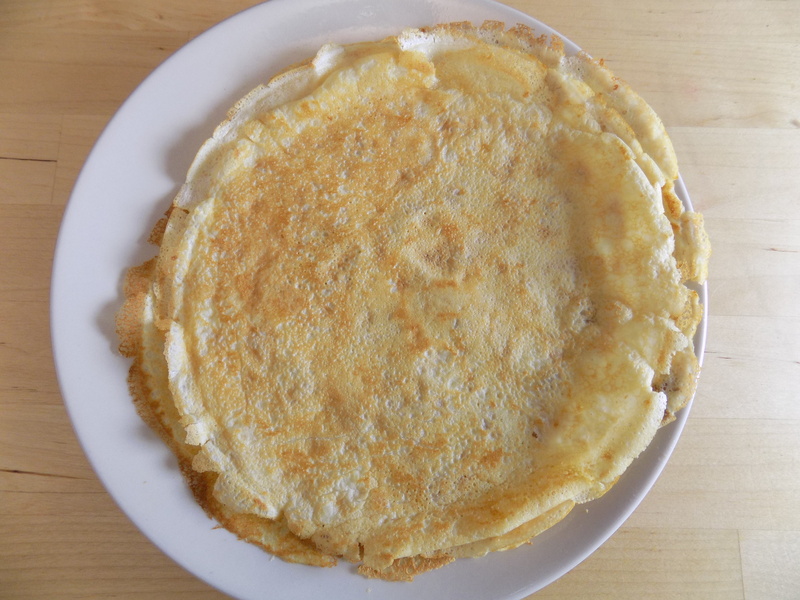 Legend’s mom’s crepes are a softer, more stretchy texture. Because the batter is liquid, you can make this quite thin. It’s also handy that you don’t need to fry them in butter because the butter is in the mix. 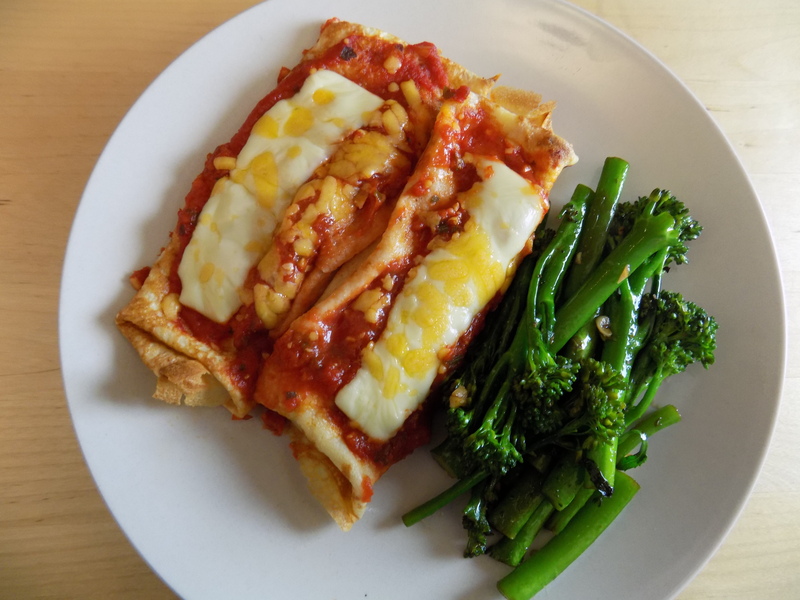 They are also a good vessel for toppings, including a really nice dish where the crepes are wrapped around cheese and mayonnaise and then covered in tomato sauce and baked. So who wins? Well, our house is divided on this issue. I like the simplicity of mine, which only have a few easy-to-find ingredients. Legend loves his mom’s recipe. I think it really comes down to what you want to do with them. I preferred mine for sweet toppings but I think Legend’s mom’s are better for savory dishes. Tried one or both of these recipes? Which one is your favorite?